Many times unfortunately, cats are surrendered to shelters because they develop behavior issues. The good news is that there is a lot that can be done to resolve those issues. Not only can you resolve those issues but you can also better your relationship with your feline. 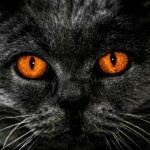 Some of the things that people consider to be bad cat behavior would be scratching the furniture, peeing in places that they’re not supposed to, peeing outside their litter box or trying to dart out the door and escape if you have an indoor cat. You should never negatively punish your cat. It’s not needed especially physical punishment like hitting them using a water bottle. It’s not necessary for cats and that’s not how they learn. It’s quicker to use positivity when they are doing something right rather than negative. It’s really important to keep in mind with cats that if they’re doing something that you don’t like, you want to try to avoid using punishment because unlike dogs, cats don’t tend to understand what it is that you’re punishing them for. So, it’s better if possible, to prevent them from doing the bad behavior that you don’t like and usually you can do that by changing the environment and then to create an opportunity for them to do an alternate behavior. The worst thing that you can do to your cat is not give it attention or lock it away in a room for a long period of time. So let’s say your cat is doing something which annoys you and you go put them in a different room. After a certain amount of time and depending on the cat, you’ll notice they don’t really like that. They might start meowing or make noises to get your attention. Not only does it really not help, but if you’re physically going to harm a cat, it is very easy to do serious damage to them. You don’t do it ever and there’s no reason for it. In terms of discipline, it’s not hitting them and not screaming at them. It’s just simply putting them into a different area or putting them in a closed room for a short duration. It’s removing them from whatever they’re doing, so that they learn that whatever they’re doing, you don’t want them doing that. You move them and you take them out of the environment. That is the best way and it might take some time, consistency and patience. So, if you’re not willing to do that, maybe a cat isn’t for you. You could give them an opportunity for an alternate behavior. It could be something that takes place of the unwanted behavior that they were doing. Scratching for example is not a bad cat behavior. It’s just a behavior that is happening in the wrong place. The cat uses scratching as a means of stretching, marking, waking up from an area, etc. Usually they’re scratching your furniture because they woken up from a nap and they want to stretch out. Clawing also lets your cat communicate his presence in the room by leaving a visual signal of the scratch marks and also leaving behind a scent from glands in its paws. A better way to resolve this issue is to redirect their energy towards a better outlet. If you place a new scratching post in front of the area that your cat’s been scratching, which is usually the side of a piece of furniture, then that will block the old area so that will stop and prevent the old behavior because you’re changing the environment. 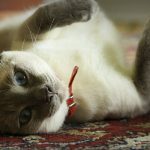 This will create a place for your cat to engage in the new behavior and then you want to reward that new behavior and that might be by praising your cat. For example, you could use something like a cat toy to attract your cat to want to be near the post and hang out there and play in that area. You may experiment with different types of scratching posts for your feline. For some cats, a vertical scratching post is best. A lot of cats like to stretch up really high as it feels good and it leaves a bigger signal. Other cats may like horizontal scratching posts. 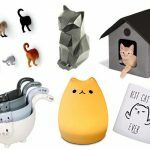 So really see what your cat likes. In terms of potty training, cats are so much easier to potty train than dogs. For cats, you just put out the litter box and for the most part, they understand because of the scent, that is where they’re supposed to go. However, if you notice that your cat is not going to the litter box right away or if they go to the litter box sometimes and other times they go somewhere else, that’s definitely an issue. This could be due to medical reasons or could be due to the change in their environment like adding a new family member or a new pet or something like that. As with any behavior problem, talk to your veterinarian first. This is especially important when it comes to your cat having litter box issues. 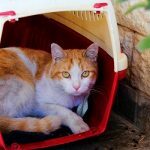 You want to make sure that the elimination problem isn’t occurring because your cat’s in pain or has other medical conditions. Some conditions can make urination painful or getting to the box difficult. Some cats also spray or mark areas when they are stressed. 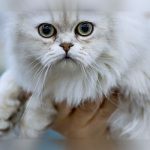 If your vet has confirmed that your cat is indeed healthy, here are some things that you should consider when it comes to your cat’s litter box. Is the litter box too small? The litter box should be at least one and a half times the length of your cat’s body. Does it have a motorized cleaning function or a cover? Some cats are okay with these but others not so much. It’s scary and they don’t like being enclosed or things moving around. Is it the litter that you are using? Most cats prefer clumping, non scented litter. One indication if your cat likes their litter is that they are actually doing a lot of digging. 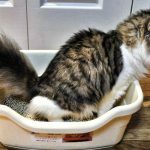 Are you cleaning the litter box well enough for your cat? They should be scooped out at least twice a day and cleaned with non scented cleaners. Litter box should not be shared with other cats and should be placed in easily accessible areas. They should be placed in low traffic areas so that your cats can have some privacy. If you have a cat or if you know somebody with a cat, you know this is issues with cats that they try to scratch everything. What do you do? Get a scratching post and instead of yelling or screaming or hitting your cat, simply pick them up and put them on to the scratching post. They scratch on the scratching post and you reward them with positivity and love. Maybe you give them treats. You let them know that that’s what you want them doing, in a positive manner. 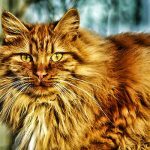 If you notice that your cat is being aggressive toward another cat or other animals, this is definitely another issue. Let’s say it is food aggression. So you have two cats or three cats and you notice that there are certain cats that are not getting along. There are a couple of routes that you could take. One, you could feed the cats in separate rooms so during the feeding times; every cat is fed in different rooms. You’re not solving the problem but avoiding it. But in reality they’re not going to be fighting over dominance anymore. They’re not fighting over the food because they’re hungry but they’re doing it for a dominant factor. Two, maybe the cats just need to get more acquainted with each other. Maybe they need to just play together. You may slowly get them together in a closed controlled environment, feed them and monitor them. Lastly, neutering or spaying will help make your cat less aggressive with other cats, reduce urine marking and also decrease the risk of various cancers. One of the most important things to do with the cat is to never use your hands during play. A lot of people will do this especially when the cat is a kitten. So they may be petting with the cat and then using their hands to get the cat a little excited. The cat starts scratching and mouthing and it may look kind of cute especially if the cat is really small. When that cat grows up and gets some really sharp teeth and sharp claws, it’s not so fun anymore especially if kids try to do the same thing. So if you’re not using your hands to play with your cat how can you play with them? One of the best things you can do is to redirect their predatory behavior towards a toy. Some of cat’s favorite types of toys are feather toys. This is really fun for them because it looks like prey and they get to go chase it and it is much better than your hands. Try and play with them about two to three times per day. 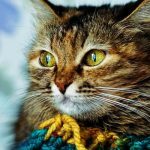 It can be really short sessions about two to ten minutes or anything like that is going to make a big difference for your cat. The other really important thing for cats is that they’re predatory animals they like to hunt and they are very active. However we really mess that up sometimes because we feed them only out of the food bowl. But if you use a food puzzle, it makes a lot more natural and it makes them use energy to actually get their meal. Something that they can use their paws with and you can fill them with different types of spreads or even their regular kibbles. That way they can get out some of the extra energy and it makes playtime and mealtime more fun for them. Now some cats are hard mouthers when they play and it can definitely hurt. One of the things that you can use to protect your hands is actually using gardening gloves. By putting on your gloves you have a little bit of extra protection. When the cat mouths, just freeze in place and wait for them to stop and then redirect them to their toy and when they’re playing with their toy make sure to reward them with lots of praise using treats and interact with them. So the toy is the fun thing and not your hands. The same goes for yelling. All that a cat wants is your attention and maybe some treats or whatever. But when you have their attention, that’s what they want. So when you scream at their bad behavior, you have the cat’s attention and you gave them basically what they want. Therefore they might continue with their bad behavior to get your attention. The next thing I’d like to point out is a cat’s energy. A lot of owners don’t realize how much energy a cat actually has. Some cats are more energetic than others but make sure you have a scratching post and toys and you actually play with the cat. For cats, scratching releases energy and helps to stretch her joints. If you want the energy to go down, you have to play with the cat and find ways to allow the cat to release their energy or else they’ll just be running wild. It’s very easy to overfeed your cat. They need to be on a very strict diet. Once in the morning, once at night or whatever works for you, but you don’t want to overfeed your cat. It can become unhealthy very quickly and you should do your best to try to monitor what they are eating. One thing you may notice about your cat is they play throughout the night and sleep during the day. For a lot of owners they don’t really like that. You can train a cat to get out of this habit or pattern at a very young age but it’s something just to be aware of. As you are probably aware cats have the amazing ability to jump to high surfaces. So if you are not prepared to have your cat jump on high surfaces since it’s not safe, you need to make adjustments immediately. If you notice that when your cat goes to a certain place and starts urinating or marking its territory or doing something in a negative way, you need to stop that behavior immediately before it gets any worse. Just calmly move them away in a positive way and when they do something correctly you reward them. Engage them in a different activity like playing with a soft toy. A lot of owners think that it’s cute when their kitten plays with them and like scratches their hands or starts play biting and it is cute especially with other cats. But you want to make sure the behavior is watched. You don’t want the behavior to become aggressive in any way because you just want to be able to make sure that their behavior is monitored. If anything does get a little bit out of control you just separate them. You take control of the situation and let them know that such behavior isn’t allowed and they can immediately go back to play. With any discipline you need to act immediately while the cat is doing it. If it happened ten, twenty or thirty minutes ago, it does not exist in the cat’s mind. They don’t remember and they don’t understand what they’re going to be in trouble for.